The Civil War and Baseball. 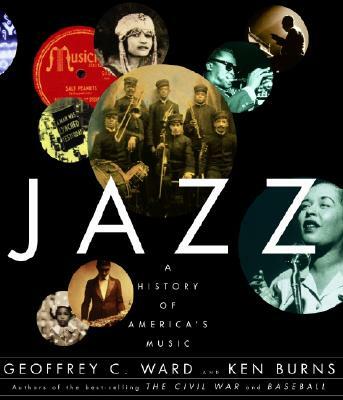 Continuing in the tradition of their critically acclaimed works, Geoffrey C. Ward and Ken Burns vividly bring to life the story of the quintessential American music—jazz. Born in the black community of turn-of-the-century New Orleans but played from the beginning by musicians of every color, jazz celebrates all Americans at their best. Here are the stories of the extraordinary men and women who made the music: Louis Armstrong, the fatherless waif whose unrivaled genius helped turn jazz into a soloist's art and influenced every singer, every instrumentalist who came after him; Duke Ellington, the pampered son of middle-class parents who turned a whole orchestra into his personal instrument, wrote nearly two thousand pieces for it, and captured more of American life than any other composer. Bix Beiderbecke, the doomed cornet prodigy who showed white musicians that they too could make an important contribution to the music; Benny Goodman, the immigrants' son who learned the clarinet to help feed his family, but who grew up to teach a whole country how to dance; Billie Holiday, whose distinctive style routinely transformed mediocre music into great art; Charlie Parker, who helped lead a musical revolution, only to destroy himself at thirty-four; and Miles Davis, whose search for fresh ways to sound made him the most influential jazz musician of his generation, and then led him to abandon jazz altogether. Buddy Bolden, Jelly Roll Morton, Dizzy Gillespie, Art Tatum, Count Basie, Dave Brubeck, Artie Shaw, and Ella Fitzgerald are all here; so are Sidney Bechet, Coleman Hawkins, Lester Young, John Coltrane, Ornette Coleman, and a host of others. But Jazz is more than mere biography. The history of the music echoes the history of twentieth-century America. Jazz provided the background for the giddy era that F. Scott Fitzgerald called the Jazz Age. The irresistible pulse of big-band swing lifted the spirits and boosted American morale during the Great Depression and World War II. The virtuosic, demanding style called bebop mirrored the stepped-up pace and dislocation that came with peace. During the Cold War era, jazz served as a propaganda weapon—and forged links with the burgeoning counterculture. The story of jazz encompasses the story of American courtship and show business; the epic growth of great cities—New Orleans and Chicago, Kansas City and New York—and the struggle for civil rights and simple justice that continues into the new millennium. Visually stunning, with more than five hundred photographs, some never before published, this book, like the music it chronicles, is an exploration—and a celebration—of the American experiment. Geoffrey C. Ward is the author of eleven books, including A First-Class Temperament, which won the 1989 National Book Critics Circle Award and the 1990 Francis Parkman Prize of the Society of American Historians. He has written or co-written many documentary films, including The Civil War, Baseball, The West, Thomas Jefferson, Not for Ourselves Alone, and Jazz. He lives in New York City. Ken Burns, founder of Florentine Films, is a director, producer, and writer who has been making documentaries for more than twenty years. His landmark film The Civil War was the highest-rated series in the history of American public television, and his work has won numerous prizes, including the Emmy and Peabody Awards. He lives in Walpole, New Hampshire. With essays by Dan Morgenstern, Gerald Early, Gary Giddins, and Stanley Crouch. And featuring interviews with Wynton Marsalis and Albert Murray.